Michael Nyman wrote the soundtrack to "Prospero's Books," Peter Greenaway's film version of The Tempest. Noises, Sounds & Sweet Airs is related in theme - this is another idiosyncratic setting of the same Shakespeare play - but not in music. This recording is an adaptation of Nyman's score for Karine Saporta's opera-ballet La Princesse de Milan, which was completed after the film. However, Saporta was the film's choreographer, so these names form quite a promiscuous little tangle. Nyman's setting also is a promiscuous little tangle. He uses three singers to "play" over a dozen characters; different singers can "play" the same character at different times, or two can "play" the same character at once. Sometimes the tenor represents Miranda, sometimes the alto represents Prospero, and so it goes. Obviously there are no fixed roles or characters in this opera-ballet, whose performers serve a more representational, less literal role than they would serve in most stage works. Also, Nyman has chosen not to set Shakespeare's songs, already having done so for Greenaway's film. (The film's soundtrack is on London 425 224-2). At first listen, Nyman's seventeen-section score seems to offer little more than his characteristically herky-jerky, chugging minimalism - a sort of classical rap - but repeated exposures reveal landmarks, peaks and troughs, and patterns. Nyman's unusual distribution of Shakespeare's words, as described above, has a distancing effect, and this effect is emphasized by the musical settings themselves, which are not obviously illustrative of the text. 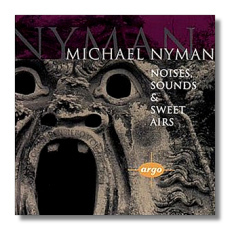 However, working with the boundaries of his style, Nyman, using unusual instrumental and vocal sonorities, does find a kaleidoscope of colors and moods. For example, in Section 9, which begins with Caliban's "Sometime like apes, that mow and chatter at me," Nyman uses a jagged vocal line and a mournful, wrong-key saxophone to depict Caliban's distress. Later in this section, the alto joins in to sing Stephano's bawdy sea chanty about Kate, whom "a tailor might scratch ., . where'er she did itch." Hilary Summer's extraordinary alto voice, seemingly half-male and half-female, is perfect for this outrageous scene, as it is for Nyman's entire concept. The other performers are excellent too, although Catherine Bott's diction could be clearer, and some of Ian Bostridge's music lies a little low for him. (The dancers sang these parts in the stage production - that must have been almost as cruel as Philip Glass's vocal demands on the dancers in Einstein on the Beach). They are accompanied by a chamber ensemble with particularly important parts for two saxophones. Debart and the Ensemble Instrumental de Basse-Normandie were the score's original performers, and so their contributions to this recording presumably are authentic. The recording quality is good, and Argo includes the full English text in their booklet. Noises, Sounds & Sweet Airs is growing on me.